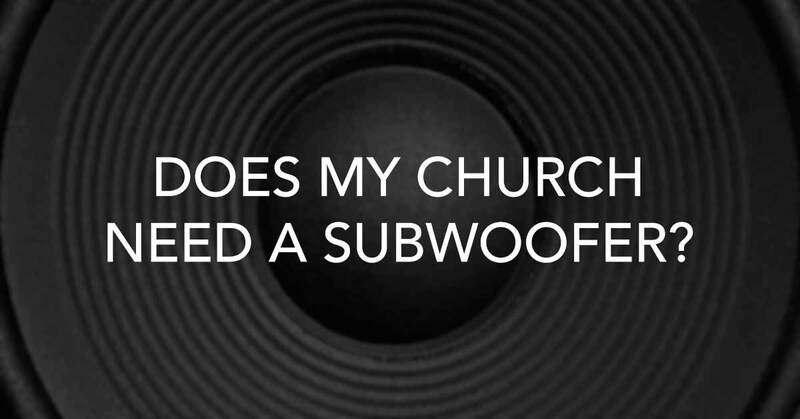 Does your church need a subwoofer? I have heard this question many times, and mainly from the older group of church leaders. For those who grew up without subwoofers, it seems like an unnecessary expense and way to much ‘noise’ for church. However, the younger generation knows that a ‘sub’ is absolutely necessary for quality sound, whether it be in church or in their car. So, what does a subwoofer do anyways? Subwoofers (or “Subs”) add a range of frequencies (120Hz and below) to the overall sound that is absolutely necessary if you desire a ‘full’ sound from your church sound system. Your main speakers may be producing these frequencies, but it is not near enough to compensate for the rest of the sound produced. What is going on in this frequency range? Mostly the sound that you ‘feel’ more than you ‘hear’, which is mainly produced by the bass guitar and kick drum. Have you ever been to a concert where you could feel the kick drum in your chest? You may not want that much for your church service, but I can guarantee that adding a subwoofer to your sound system will add energy and depth to your worship band. When my church was planted in 2008, our first sanctuary was about 2,000 square feet, which would be considered pretty small. In this space, we had no sub, but we did have JBL JRX125 Dual 15” cabinets for our mains. These did a fairly good job reproducing lower frequencies, but it was always lacking that ‘in your chest’ energy. The bass guitar always seemed too ‘in your face’ and was a bit painful to the ears. In 2011, we moved into a new sanctuary, about 6,000 square feet, and purchased a new sound system that included a JBL728S Dual 18” Subwoofer. We feed this sub 3200 watts from a Crown XTi 4000. Going from no sub to this super-powered sub was probably the most exciting sound system purchase I have ever made. The energy that this speaker adds to worship is amazing. I can remember the first service with the new sound system, as many of our ‘subwoofer virgins’ were holding their chest through the first few songs, wondering if their heart was beating quite a bit harder than normal. I admit, we were probably running it a bit too loud at first, but the people still loved it. You can’t help but dance and move around with that much energy in the room, it is a very freeing experience! So let me ask, is your church sound system described as ‘thin’, lacking energy, or lacking depth? Then it is probably time to purchase a subwoofer! we are meeting in a church that is about 1600 square ft. rectangle…have a decent sound system and was just given a 15″ subwoofer. ..had been using a home surround sound woofer. where do I place it for maximum effect? thanks..
Mike – I am currently leading worship in a room about the same square footage. We have two 18″ subs right next to each other placed in front of the stage near the middle. We started out with on sub on each side, under each main speaker, but then found that front-middle gave us quite a bit more ‘thump’. In your situation, putting your sub in front-middle would probably work best as well. However, I would experiment with putting it in a corner to see if you get more ‘thump’ out of it. Hope that helps! Middle works well with two subs because it gets rid of the comb filtering effects of having them at each side of the room. One sub on the floor against the wall gives you the biggest bang for your buck. I am looking at installing a sub in our church (limited budget). Our sanctuary is one of those long thin layouts, about 4000 square feet. Would one 15 or 18 inch 400-600 watt rms sub, placed in the middle front, be sufficient for some good sound? Damon – I am currently leading worship in a 3,000 square foot hall-shaped sanctuary. We have two JBL MRX518S subs, each powered by its own Crown XTi 1002 which gives 1,000W at 8ohm bridge. So a total of 2,000 watts of power split between two subs. There are many times when I wish there was more power to work with, but it gets the job done nicely most of the time. So, I believe you will find 400-600 watts insufficient for your application. I strongly suggest getting at least a dual 18″ sub at about 2,000 watts of power. Since you are on a budget, take a look around Craigslist. Used equipment would be better than taking a shortcut and only getting 400-600 watts. We are a Church of 400 people and to upgrade our sound system and have never used Subwoofer. I need to decide between if I need to get Yamaha DXR15 or DXR12 and I am need of advice if I need to go for 15 or 18 inch sub and which model. Or can I go for 15inch and place in middle. We are not playing drums and we music will be of acoustic guitars, bass, cajon, congas and percussions. Finally I need to decide between digital or analog mixer for our clutch much.Your advice will be much appreciated. Thanks for reaching out, Yogen! I recommend you go with the 18″ sub, as a 15″ sub is generally not a good solution for live music. Even without drums, you will still want a sub that can easily push out the low frequencies that you ‘feel’ in your chest. This is where the energy comes from in sound. I am not familiar with Yamaha subs. I have always used JBL and been happy with the results. At my church, we still use an analog mixer but I hope to upgrade to digital soon. There are so many benefits to digital. Plus, you can get them fairly cheap now – like the Behringer X32. You should definitely go with digital if the budget allows. Wonder why i did not come across your site earlier! It has so much info that I needed very much. We are currently looking into moving into a 4000 square feet place for our worship and being a stubborn cow, I had always insisted on Peavey products. I think I should be moving on to JBL. At present, our worship hall of 2000sqaure feet comprises of x2 Peavey SP2BX powered by a CS3000 and processed thru Behringer 2496. We have x1 Roland TD15, x1 Korg Synth, x1 Yamaha Piano, x1 Bass, x1 E.Guitar and x8 vocals running thru Peavey FX 32 channel mixer. If I would to change to JBL system, what would you recommend for a 4000 square feet hall? Many thanks for the advices!!! I have had experience with both JBL SRX and MRX subs – and SRX was way better. The JBL product line has changed a lot over the past few years, but I just noticed they came out with the JBL SRX828SP Dual 18″ Powered Sub. I’d recommend getting two of these guys for your size room. Hope this helps! Great article, and everything you say is true. However, you didn’t sell it to the senior adults! I am sixty-one, a former pastor, a musician, a bass player, a sound tech in our church and I love subs, I “get” the need for energy in church music, and I look for that thump, thump from the bass and low tom drums and low end instruments. But most senior adults see no need at all for any of it, and infact are adamantly opposed to anything that manipulates emotions in a worship service. Unfortunately, in most churches, they pay the bills and make most of the decisions. Find a couple of seniors and ask them how to educate and then convince older people of the need for subs, then write an article specifically targeted to engage them in the justifiable needs. Elderly people generally don’t want to “feel it in their chest.” Try something along the lines of reaching out to the lost and the younger generations, making a cultural connection with the “next” generations, how to bridge the age gap, making the church ‘relevant” for today. Even that might not convince the “old guard” but it certainly is important to try. People with hearing aids, false teeth, and pacemakers are often driven out by speakers that cause their ears to hurt, their teeth to fall out and their heart to thump, thump, thump. And for every one’s future hearing, try to keep the sound pressure under 105db at all times. No, that is not loud, but it is not a techno-dance club, it is a worship venue. The music service is not the “worship service” it is an important part of worship, but worship is about God, not about how well “I” like the band’s sound. Love your article though, it had some very important information. Totally agree, Mark. It is tough to get the older generation on board with subs, and I am always looking for ways to help them understand, and to be understanding myself. That being said, I don’t think I have ever played worship loud enough to knock out someones false teeth. We are generally between 90-100dB at our church. There is plenty of energy, but definitely not the kind of excessive energy you will get at a big concert. For me, it is all about a balanced, full-range sound. Kade- I’m struggling. We have 2 18″ Subs on the sides of our rectangular church, which seats about 200 people. Our sound booth is on the very back wall, dead center, and elevated about 2 feet. The Subs are “built in” the stage unobstructed, and on the same level as the audience. I always mix from the audience via iPad, but I never feel like the Low frequencies are enveloping me the way I want them to. They’re just loud and seem to fly over the audience. When I’m in the sound booth, I get that feeling we all know and love from subs and it’s almost too much. I want my audience to feel that (maybe just a little less), but I don’t know why it seems like the audience is missing it entirely. Do you have any ideas? Hey Nate – Unfortunately, in a rectangular room you are always going to have inconsistencies with low frequencies. They will sound great in one part of the room and not so great in another. There are things you can do to make it better (like installing bass traps in the corners of your room, or experimenting with where you place the subs), but in the end, you will still have inconsistencies in a room that wasn’t built for sound. I wish there were a ‘magic bullet’ to fix this problem, but if there is, I haven’t found it yet. What about jbl srx828sp? I’m thinking about that one. Actually, the good thing about this is that it has great sound. Definitely a great sub. I love the JBL SRX series. Thanks for taking the time to lay all of that out. Your Post absolutely very helpful for people those love music. I know i loved it I hope other people will too.Thanks again! So much of this is factually incorrect, and highlights the problem of most modern “sound engineers”, who use subs to mask poor set ups with improperly set crossovers or inadequate system design. In general subs in such venues, rather than add to high fidelity of sound reproduction, only serve to cover over gaping holes in the reproduced frequency spectrum, both as reproduced and as perceived because of this poor system design. In mosty venue, even professional concert venues, subs simply are not needed, and the same, or better, sound reproduction can be achieved with better thought out system implementation.